Free Shipping Included! Save 1% on the Ultra Lube 10322 LMX Red Lithium Grease- 35 Lbs Plastic Pail by Lubrimatic at Beaver County Collision. MPN: 10322. Hurry! Limited time offer. Offer valid only while supplies last. UltraLube LMX red grease biobased lubricants are manufactured from renewable vegetable-base stocks which have a naturally higher viscosity index. 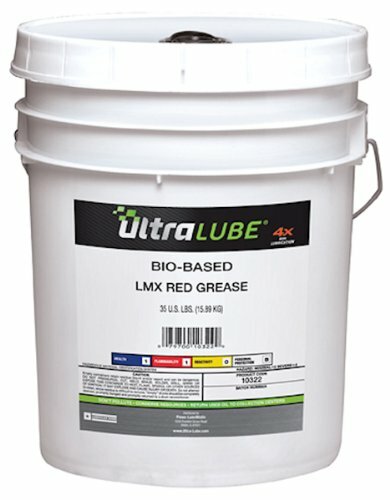 UltraLube LMX red grease biobased lubricants are manufactured from renewable vegetable-base stocks which have a naturally higher viscosity index. This means that bio-based oil is likely to "thin down" at high temperatures providing reduced overall operating temperatures and a higher degree of lubrication-safety, especially in high speed applications. These UltraLube products are premium quality biobased products formulated from renewable, biodegradable USA-grown vegetable oils. These lubricants are designed to replace and mix with conventional petroleum products to help you and your customers use safer lubricants. It's a premium, water resistant EP grease that meets NLGI's tough GC-LB specifications. Ideal for heavy load applications. If you have any questions about this product by Lubrimatic, contact us by completing and submitting the form below. If you are looking for a specif part number, please include it with your message.